Saga from Image Comics is out of contention for this monthly prop, because every issue is pretty much a masterclass in the medium. Still, if any comic out there comes close to rivalling my man-crush on the staple Image title, it would be Harbinger from Valiant - and if any issue could explain better than most why, it's issue fifteen. Billed as a "jumping on issue" in the wake of the Harbinger Wars, you could forgive your eyes for rolling at the term. People who don't read the book have almost become numb to how often the term is used in today's market to really believe it is such, and existing readers think the issue branded in this way will be wasted in a Cosby Show esque series of flashback origin sequences. In crafting Brightest Day, writer Joshua Dysart uses these perceptions to help lull you into a story whose last page will literally leave you shaking, even if you've never read a Harbinger or Valiant comic before. The journey the five nomadic super-powered teens go on through the issue is even teased at in the addition of JLA: Year One artist Barry Kitson to the series. On the cover is the Kitson style we know; bright, clean and wholesome, then on the interior, inkers Stefano Gaudiano and Mark Pennington give Barry's art an indie texture, a darker tone and as they do so, so to goes the story. Without giving the ending away, uber Harbinger Peter Stanchek, childhood friend Kris, buoyant Faith, thermodynamic Charlene and my favourite; self conscious Torque celebrate surviving the war by heading to the home of partying, Venice Beach, for a little R&R. 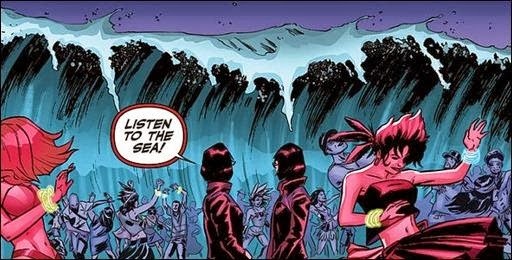 Dancing, the surf and hijinks are abound, as without the fear of being chased, the team gets to let their powers and their guard down. See? Even when he was writing Unknown Soldier for Vertigo, Dysart knew how to write people. Here his abilities to set up the cast like a jump on issue yet still progress them at the same time are in full force. Especially as the group splits in three (two illegal car hires later), the scenes start changing more rapidly, and the issue progresses. Bass concerts, underground metal or the skyline at night, we all rage it up on holiday. Some like to spontaneously kiss unexpected recipients, some like to amp up a crowd, and some just like to listen to the ocean. As the night draws on and the tide rolls in, Torque will realise just how foreboding his comment in the skate park about 'epic action' truly was. If only the team could have prepared for it. In summary, this issue has all the humour, drama and well-written characters you could hope for in a comic, and then some. 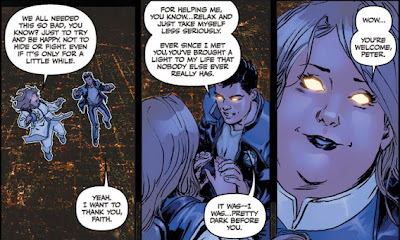 As Harbinger's are people with latent special abilities, you might find yours is being a series addict upon reading this issue. 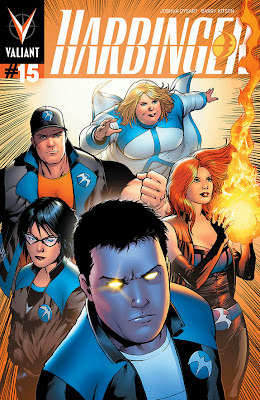 Believe me, you don't want Harbinger getting to a TV series (or more) before you realise what you've missed out on. I always suspected comic book reading was my mutant power. Valiant is showing the big 2 how a reboot is done right. Things might be slightly different this time around, but the characters are all still there, familiar enough to slip into and new enough to keep us enthralled from page to page. Harbinger has been very good at this, and the whole crew from writers to artists to editorial staff deserves a big hand. Well done, Valiant. Well done. And unlike Amanda Waller, their revamped fuller figured females stay that way. I dig Valiant so much that I literally find myself re-reading the issues multiple times a month. I can't remember a time where so many books from the same publisher had that effect. Glad you're liking them too Random! I've gotta get onboard and officially buy this stuff even though I've been a big supporter on the sidelines. Like Hannah said, this, this is how a reboot is handled. And my god, you can never ever, go wrong with Barry Kitson art. Also, yeah, kudos to the creative team for slipping in realistic-looking guys and gals, no matter the weight/appearance. Between that, and reaching out to older, former creators like Bright and Priest, Valiant's shaming and schooling the big two right now in how you run a company. Yeah the Bright and Preist thing was well handled. Not many publishers let you create a series in an expired continuity because the fans liked it (looks at DC per-52) so big ups again to Valiant. I collect all Valiant books apart from Archer and Armstrong at the moment Dale, so happy to help recommend a title if you have an idea of what you'd like to read.